Almost no one expected it, but the sensational improvement (more then 2.5 km) of the worldhourrecord for unfaired recumbents done by Gert Jan Wyers of october 2008 is allready broken! But we can be glad allthough we lost this record of Gert Jan since it is kept in the " M5 family". And to everyone's surprise: it was done with an 18-year old concept: the M5 Cr-Mo Low Racer. Still a bike with potential it seems. Place where it happened: Velodrome indoor track in Bordeaux, France. Rider: the frenchman Aurelien Bonnetau. He was allready very succesfull earlier this year inbetween hundreds of roadbikes in the well known " LOOK" race where he finished solo minutes ahead the peloton!! 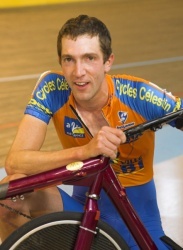 Funny detail: The Velodrome in Bordeaux was in september 1994 also the place where M5 founder Bram Moens did set a new worldhourrecord for recumbents with Tail Fairing (51.123 km). We are very curious what Aurelien should perform with the tuned M5 CHR which weighs some 5 kg's lighter then his current recordmachine. 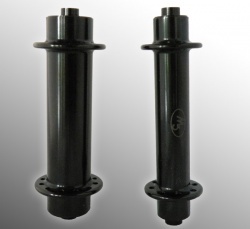 Left: new M5 heavy duty front hub (52 gram), right: M5 standard light weight road hub (33 gram)M5 has developed a new heavy duty front hub for heavy users that weighs just 52 grams. or a larger amount of spokes (24, 28, and 32) we have developed a new front hub that is very well suited for heavy users, weighing over 80 kilos (~176 pounds). Inside the hub are two super smooth rolling ceramic bearings. It is our goal to start shipping this hub in the summer of 2009. The hub will be available in the colors black, red and white. Although this is the 'heavy duty' version of our hub at 52 grams it is still much lighter than all other hubs manufactured elsewhere. The material used is Alu 7075-T6, the hub is hard anodised and finished with a laser etched M5 logo. Due to our attempts for a better efficiency we decided to adapt our telephone accessibility slightly. We therefore take the phone between 12.00 (CET) and 17.30 hour (CET) on tuesdays including fridays and from 10.00 until 16.00 hour on saturdays. Today: M5 building exists 10 year!! Allready 10 years have been past since the official opening of the M5 building by Aart Roelandt, who commercially introduced his recumbent as the first into the Netherlands. Until today we are really delighted with our very spacious, bright and energy efficient building. The first pictures of the M5 golden hub set. especially in these times it's always good to invest in gold! Please contact us for the current prices. M5 Full carbon rims in 38 mm available! These carbon rims have an internal aluminium extrusion proflie, so inflatinf up to 9.5 bar no problem. Also aluminum reinforcement around the spoke holes. Width od the rim is 20 mm. Available in 16, 20, 24 en 28 hole versions. 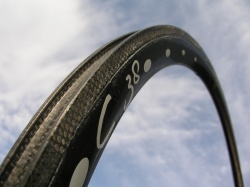 C 38 clincher, full carbon rim with alu extrusion inside. ERD size 566 mm, 475 grammes (+/- 3 %). 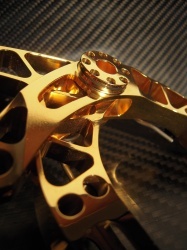 Introducing our 24-carat gold plated brake sets. These brakes are the absolute technical top: Stiff and superlightweight. This special edition is a durable and precious addition to every racing bike. And they are sooo beautiful! 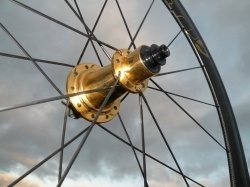 Next week on our site: Matching wheelsets with golden hubs. It will come fast, if it 's good. 24 October 2008, 13.45 uur. Gert Jan steps off his M5 Carbon High Racer. He just managed 50,3926 km p/h for one hour. He is the new World hour record king! The old record is smashed with two and a half kilometers p/h. The crowd clapped and cheered. Observers make a deep bow. Gert Jan! You did 54 kmh in the last lap! "Yeah sure! I can go even faster!" says Gert Jan. It is hard to believe that the bike that we ride to work, is the fastest bike in the world. The bike that we use for our shoppings is faster than the fastest Low Racers! You know what: We challenge you. The first man or woman to surpass Gert Jan s WRRA unfaired record on his own shopping bike (and that can also be an M5 Carbon High Racer..) wins a set of Gold plated M5 Bram Brakes with a value of 999,- Euros. We don 't think we have to wrap them up already..
Everybody who joined the party: Thanks! Mission accomplished - 50,392 km in one hour! 1. The record bike is waiting for action. Impressive detail: this bike has a front wheel that has been designed and manufactured by M5 over 20 years ago. Still doing service! 8. Youth has the future! 13.00 hours. Gert Jan Wijers mounts his M5 Carbon High Racer and clicks into his pedals. He rides his first rounds on the track of Alkmaar (Netherlands). In two weeks it's going to take place: his attempt to break the world hour record unfaired which is currently 47,8 km. A bit surprised we watch his round times: 17,2, 17,1. Has he lost his mind? Nope, Gert Jan didn't loose his mind, in stead he races with the steadiness of a metronome: 51 km/h round after round! After 45 minutes Gert Jan stops. The average speed is then more than 50 km/hour. "Yes", he says, "that last quarter of an hour should be okay too". Well, that has proved to be a correct assumption! 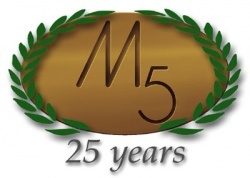 We almost forgot, but... M5 Recumbents celebrates its 25th anniversary at the end of this year! Twenty-five years of development and production and a lot of (world) records! Knowledge of materials, geometry, aerodynamics and ergonomics has been collected in the years since 1983. In the very first years M5 developed the notorious 28/20 and 28/26, which became swiftly an absolute norm in the early recumbent scene. These same bicycles can still be encountered on the road, but since then the assortment has been expanding significantly. Not only in terms of model types, but also in materials. In the early years M5 was already unique in using chrome molybdenum alloy as frame material. In the years that followed titanium and carbon were integrated increasingly in the designs. Apart from (and thanks to) the ongoing insistence to innovate, numerous national, European en world records have been set with both recumbents and handbikes. The truly unique of this situation is that the design, the construction and the records themselves were usually done by one person (Bram Moens)! Through the years an increasing number of other people established records on M5 Recumbents as well. A remarkable facts is that all these records have been set while riding perfectly normal production bikes! Still available for everyone! The design and construction of the record fairings was always in coorporation with rowingbike builder Derk Thijs from Middelburg. Derk had more experience with working with plastics and fibers, while Bram was more familiair with light weight steel products. Combining both skills let to a successful collaboration and nowadays they're both highly experienced with these different routines. Because of the ongoing search for other, better solutions and materials M5 still belongs to the top of recumbent manufacturers in the world. Important aspect is integrating existing first-rate technologies in the recumbent and component range, like the extremely light weight carbon and aluminium parts. The future? Continue the development! Were innovation will lead to is hard to tell. Who would have suspected ten years ago that M5 would be developing and producing the lightest bike components in the world? But now the M5 lightweight components are applied on a wide range of high end bicycles, like racing and MTB bikes and recumbents.